Grab a hold of life and squeeze the most out of it! These bucket list ideas will start you on a path to realizing your dreams. 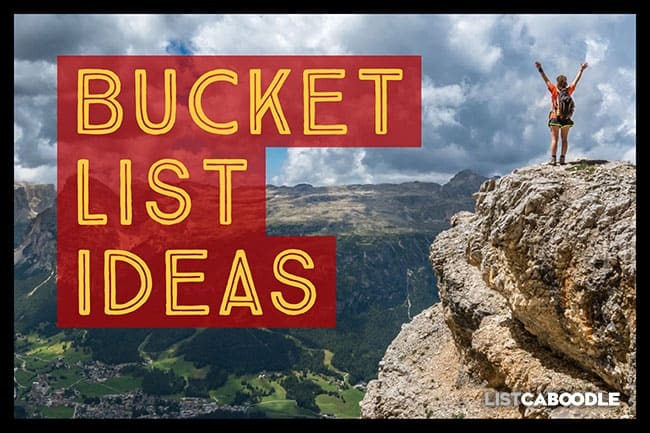 Use them to spark your imagination and come up with your own unique bucket list. Travel destinations are a popular choice for many people’s bucket lists. Many choose an exotic or legendary locale. Others will add countries to their list where travel has been challenging for geopolitical reasons (Cuba or China, for example). Check out this list of ideas for your next bucket list trip. Visit all 50 states in the U.S.
Visit all 7 continents (Africa, Antartica, Asia, Australia, Europe, North America, South America). Visit Paris—see the Mona Lisa in the Louvre. Visit Italy—ride a gondola in Venice. Visit the Old City of Jerusalem in Isreal. Snorkel/scuba dive the Great Barrier Reef. Hike along the Great Wall of China. Visit the Great Pyramid of Giza. Run with the bulls in Pamplona Spain. Attend St. Patrick’s Day in Dublin Ireland. Go on a road trip: Route 66. Go on a bike trip: Portland to Portland. Interested in videos of nature’s strangest wonders? Check out this list of weird natural wonders. Here are some ideas for those that prefer to push the limits of possibility and feel the rush of adrenaline that goes with it. Set your goal and achieve your dream. Cross it off the bucket list and move on to your next goal. Climb a mountain or volcano. Swim with the dolphins, sharks, or manatees. Go deep sea scuba diving. Break out of your day-to-day eating habits and give a few of these foods a try. These delicacies are well worth sampling and crossing off your bucket list! You may find that giving of yourself, your time or your money may bring the most satisfaction of all the items on your bucket list. Baby Boomers and Millennials are volunteering their time and talents in big ways. Here are some of the charitable activities you may want to add to your list. Give your help/time/money to someone who needs it. Show kindness without expecting anything in return. Thank a teacher/mentor from your past. Tell someone you love them. Let them know how much they mean to you. Give a meaningful toast. Check out this list of popular toasts for inspiration. Changing who you are is never easy. These bucket list ideas involve changes within yourself and achievements you can strive for personally. Remember its always easier to achieve your goals by teaming up with people and friends who share your interest. Pursue your passion without distraction or excuses. Get in shape—achieve your ideal weight by healthy eating and working out. Run a marathon or complete a triathlon (New York City Marathon). Live debt-free. Pay off your outstanding debt. Improve your career and education with these bucket list ideas. Take a chance on that coveted position. Finish your degree or learn something new. Further your education: Get a bachelor’s, master’s or doctoral degree. Live your life to the fullest! Use these bucket list ideas to spark your imagination and come up with your own unique bucket list.